Every year Michael Wiegand opens his yard to the public to observe and participate in Hummingbird Banding. The banding itself is done by Fred Bassett. 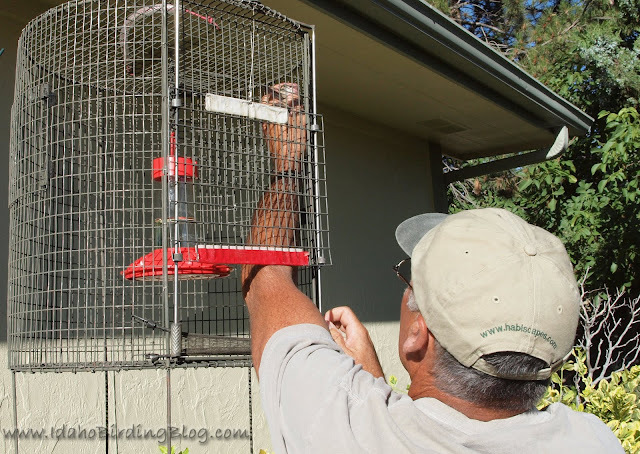 The turn out of visitors this year was great and the hummingbirds were as amazing as always. Fred does great work involving the kids and answering the questions from curious adults. Claire about to release a newly banded hummer. My kids always enjoy releasing the fishing line to catch the hummers in the specially designed cages. 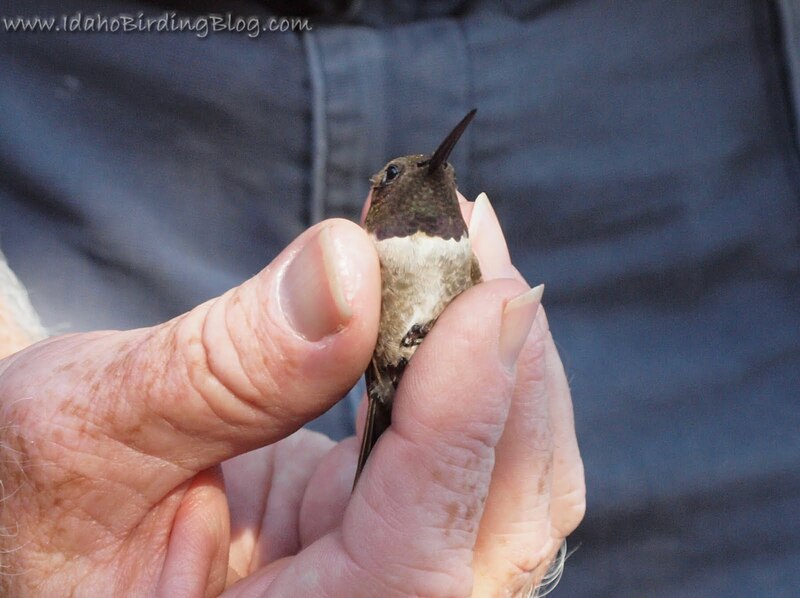 They really love to hold the tiny hummer in their hand after banding and feel the rapid heartbeat on their palm. Adult male Black-chinned Hummingbird - in the right light, the gorget is gorgeous with a purple band. Michael Wiegand gently extracting a tiny hummer from the custom built trap. Fred Z. bags another hummer for Fred B. to band and measure. 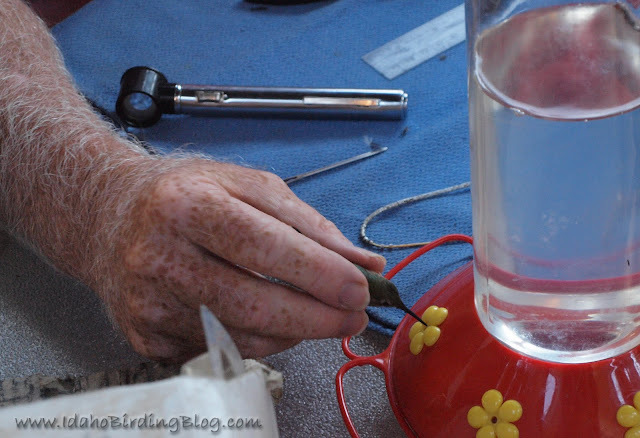 Tools of the Trade for Hummingbird measuring and banding. 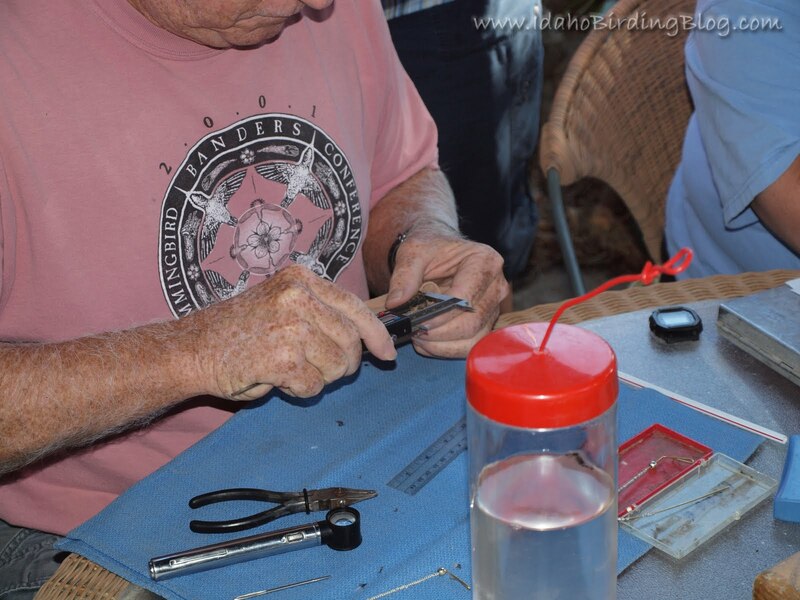 The magnifying eye piece helps age the bird by looking at the bill. 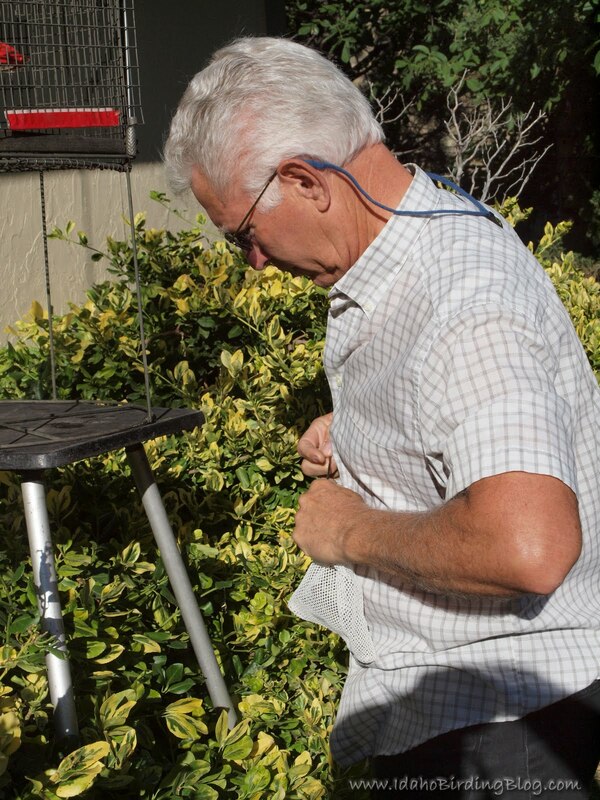 Fred can often tell the species, age, and even gender by differences in tail feathers. And a little sip of sugar water and off to Central America! 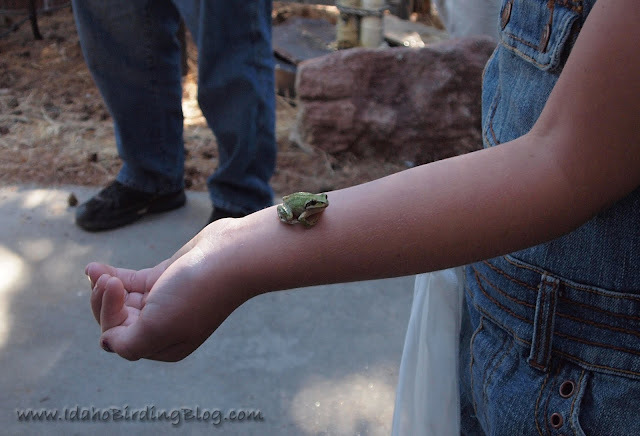 As if hummingbirds were not enough to fascinate the kids, this Pacific Tree Frog, along with large moths, rodents, and other birds sure kept the kids excited. This fun event was also a great time to rub shoulders with good people. I got to meet a few area birders and photographers that I have followed online, but had never before met. I met fellow birders Fred & Melly Zeillemaker, Bob & Robin Young hosts of several blogs including Flight of the Peregrine Falcon and Idaho Through the Eyes of a Photographer, and Debbie Smith host of Boise Daily Photo. Its always good to see folks again like Fred Bassett, Michael Wiegand of Habiscapes, and Monty Thomson of Bird House & Habitat. 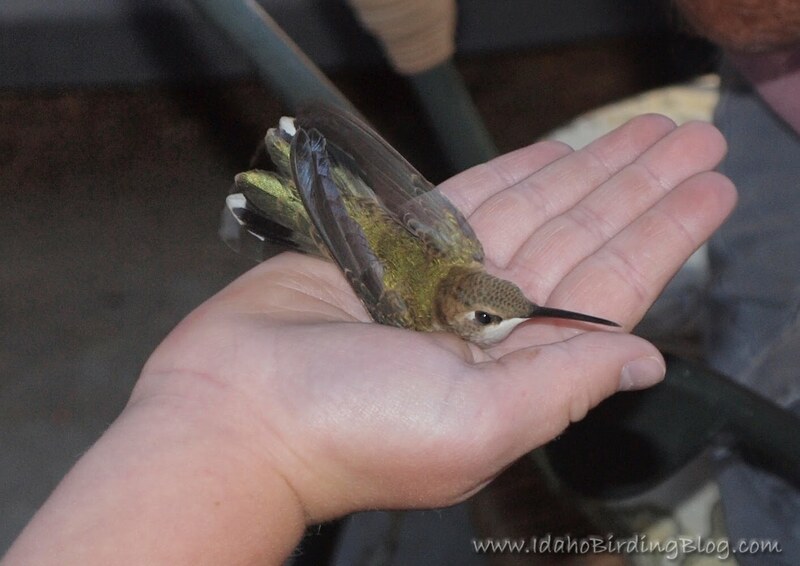 I'm already excited for Hummingbird Banding 2011! *The tiniest hummingbird of North America is the Calliope Hummingbird. What a cool experiene! I can not even imagine being able to hold a hummer still. Great photos! Great photos, Robert, and yes, it was good to meet you and your family. I hope w are on "the List" to do this again next year. Cheers!